Remember way back when, before you even had training wheels, when you had a tricycle. I do. I still have mine! 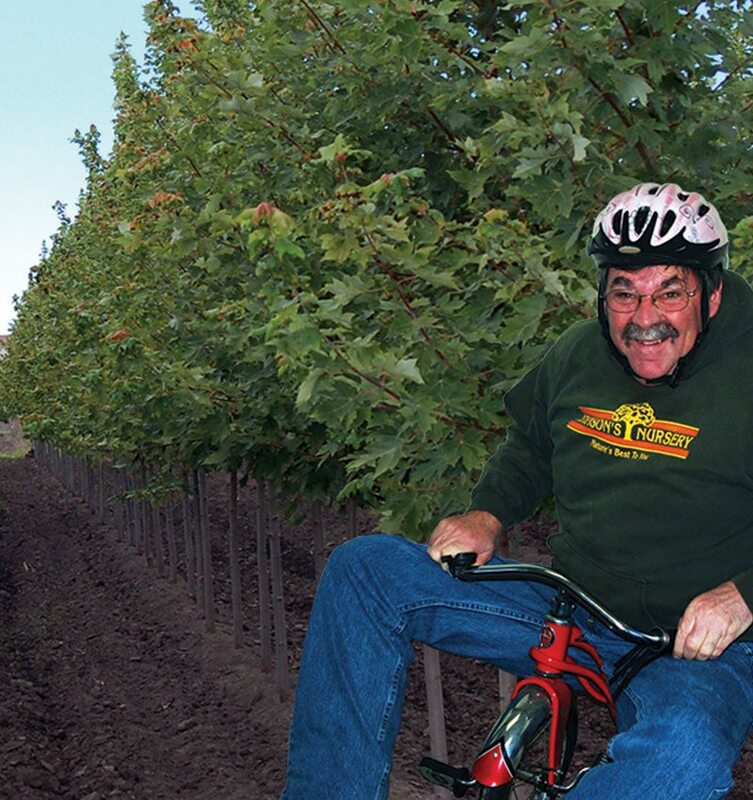 In this Plant Talk, I’m going to talk about another kind of cycle–a tree cycle, that being the cycle of production of trees at Johnson’s Nursery. It really is quite a journey. 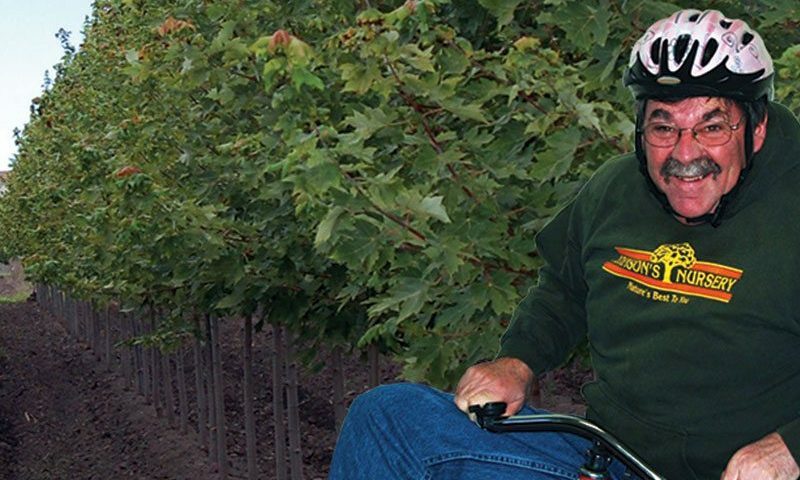 So put on your helmet and get ready for a ride as I explain the tree’s journey through the nursery from seed to a finished, landscape sized plant. Tree production in most cases begins with the purchase of a whip (a young starter tree), usually from one of the producers in Oregon, near Portland. This is the main production area for whips in the United States. 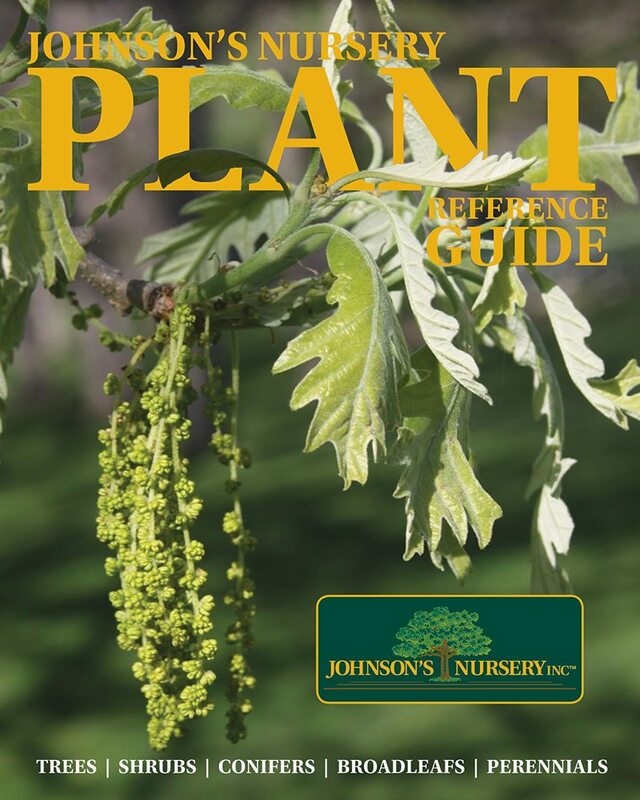 At Johnson’s Nursery, we purchase the majority of our small trees from these producers though we do grow a fair number of our own, primarily from local ecotype seeds. Some examples are Wisconsin’s Native Oaks, Musclewood, Ironwood, and a few other native species. 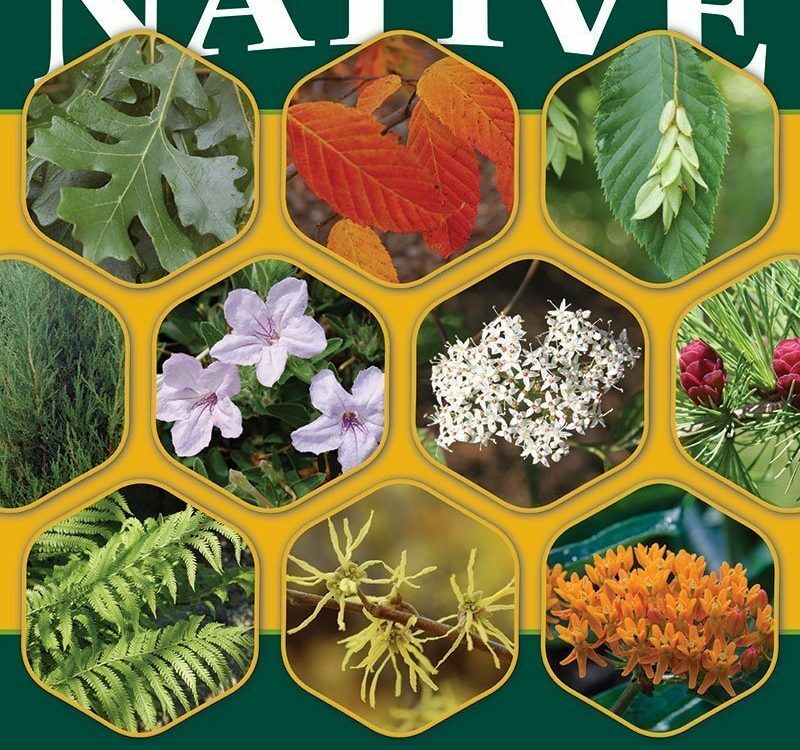 The production of these native trees is what I will be discussing in this article. The picking and processing of the seed is an involved job unto itself. At Johnson’s Nursery we pick the vast majority of our own seed. We don’t buy seed from suppliers as we feel it is important to know the characteristics of the mother trees we are picking from. It can make a big difference in the quality of the plants produced. With Musclewood, Carpinus caroliniana, we are very particular about which plants we pick from, making sure to only obtain seed from those with excellent fall color. This greatly increases our chances of having seedling plants with outstanding autumn foliage color. We time our picking to coincide with the color. We time seed picking to coincide with fall color display. Once we have acquired the seed we process it in such a way that it will successfully germinate. This varies from species to species. For trees that have berries, like Hackberry, we gather the fruit by either picking them from the plant or sweeping them from the ground. In the fall, we can sometimes be seen crawling around in the gutters along the streets of metropolitan Milwaukee with dust pans and whisk brooms obtaining fruits. It is not an aspect of propagation I dreamed of when I was choosing my vocation. We then place the fruits in a bucket of water for a few days to let them ferment slightly. Next we clean them, separating the seed from the fruit. We do this because of the presence of chemical inhibitors in the fruit that will prevent the seed from germinating. The fermentation process allows the fruit to be easily separated. The procedure entails mashing the stinky fruit and seed mixture into a paste either with a food processor or a 4×4 with the corners rounded off (like a mortar and pestle). Then water is added and the pulp is floated off. The sound, solid seed will sink to the bottom of the bucket and the lighter pulp, skins, and seeds with air pockets in them (not sound seed) will float away as you slowly pour the water off. You continue the mashing and pour offs repeatedly until all you have left is clean seed at the bottom of your bucket. From this point the seed is stratified (put in a plastic bag with a 50-50 mixture of moist sand and peat) until it is time to plant. Stratification is basically a form of trickery to make the seeds think that they are planted in the ground but are not. Depending on the species, the stratification period can be either just a few weeks or a year and a half. American Linden and Hawthorns are two types of plants that need these long stratification periods. Bottlebruch Buckeye, Aesculus parviflora seeds stratified in a 50-50 mix of sand and peat in plastic bags. As I’m sure you are realizing at this point, this is a lot of work! I haven’t even gotten to the planting and germination part yet! So let’s get growing! Most tree seeds are planted in ground seed beds in the fall. The beds are raised and have a loose sandy-loam soil. After tilling the ground and incorporating fertilizer, we broadcast the seed over the surface of the bed. It depends upon the type of tree we are planting as to the density we sow them. 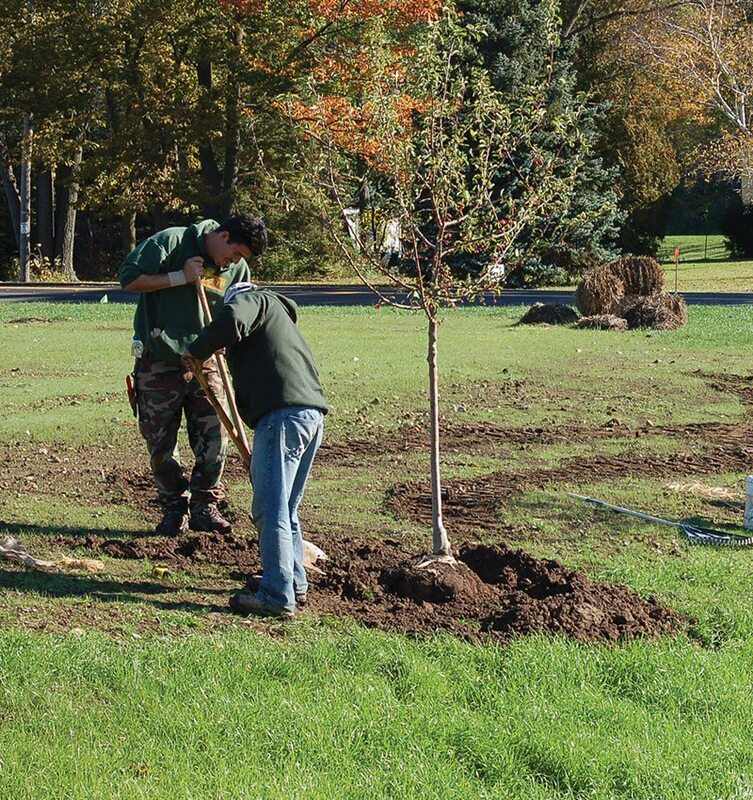 We fertilize the trees several times throughout the season and then harvest them bareroot in early November after the leaves have turned their fall color. We grade them, bundle into various sizes, and heal them into aged wood chips in an unheated insulated building for the winter. They are ready for spring planting. 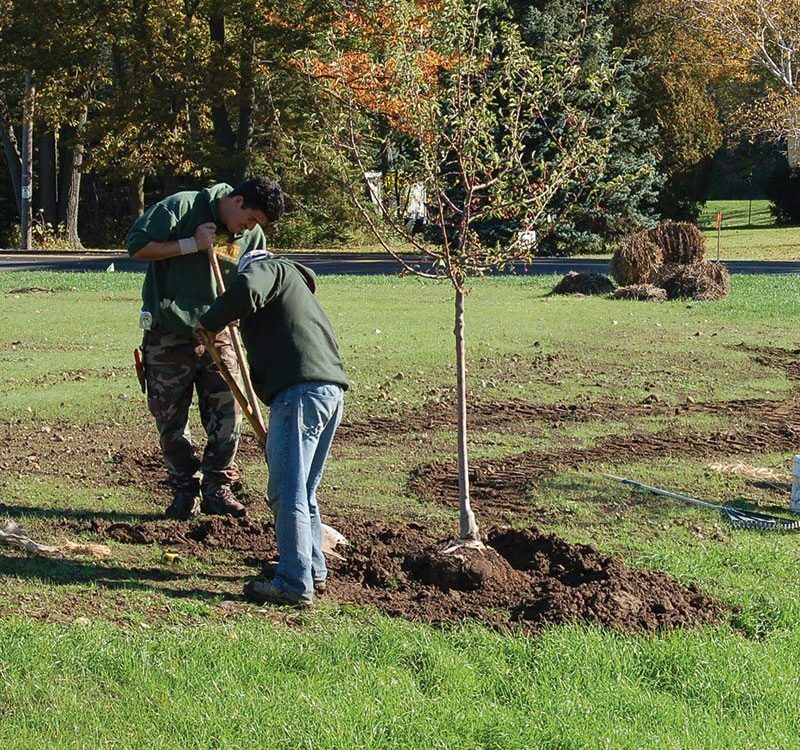 In late March to mid-April, depending upon the season, the one year old seedling trees are removed from winter storage and planted either in containers or in the field. Most go to the field into transplant rows to develop well branched root systems for a year or two. All have been root pruned to encourage branching. A well branched compact root system makes for a high quality, easily transplantable tree. From the transplant block the trees are dug after a year or two, root pruned again and are planted in rows at a wider spacing. Most of the trees are staked and grown to 4 to 6’ in height over a 3 year period. Throughout this time the trees are fertilized repeatedly, pruned meticulously, and kept free of weeds to maximize growth. Following the three year period, in most cases, the trees are dug bareroot, top and root pruned again and replanted at finished spacings. It is at this stage that the whips are developed into B&B landscape-sized materials. For most trees it will take three years to develop into a saleable size. Each of those years contain numerous maintenance activities, from pruning in the winter, to cultivating and herbicide treatments, to summer pruning on some species as well as some insecticide treatments. Hybrid Swamp x Bur Oak, Quercus x shuettei in their third year at finished spacing. The majority of the tree crops are sold in their 3rd, 4th or 5th year at the finished spacing in sizes ranging from 1-3/4” to 3” in caliper. It is at this time when they must be harvested and sold directly to the clients or are staged in holding yards both at the Jackson and Menomonee Falls facilities. When staged in the holding yards, the trees can be kept in good condition to allow for sales at times when the trees can’t be field dug. B&B trees staged in holding area for late spring through fall sales. The last stage in the cycle of production is to clear the fields of excess trees once they have reached sizes that fail to sell. This is usually in the 3-1/2” range and larger. At this point the trees are either transplanted or destroyed to make room for the next crop. Once the field is cleared the land is planted in a cover crop to help replenish the soil and reduce the weed seed bank. The next step is to start all over again! When you add up the total time from the germination of the seed to the sale of a 2” caliper tree, the average length of time for the production cycle is about ten years. 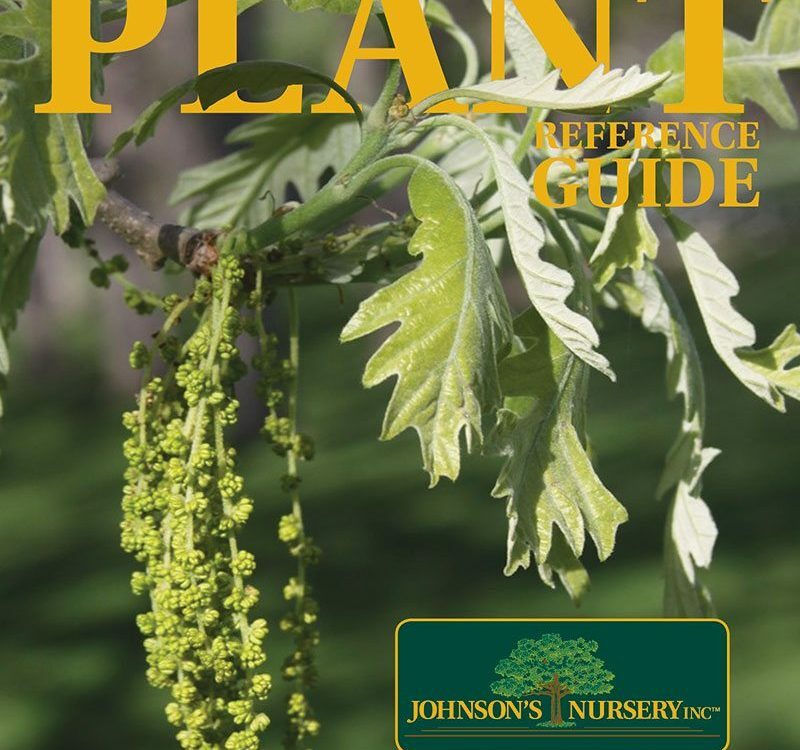 Some examples of trees that would fit into this production cycle include Bur Oak (Quercus macrocarpa), Red Oak (Quercus rubra), Chinkapin Oak (Quercus muehlenbergii), Swamp x Bur Oak (Quercus x schuettei), Common Hackberry (Celtis occidentalis) and Ironwood (Ostrya virginiana). Some species that will cycle through in a year or two sooner are Northern Catalpa (Catalpa speciosa), American Elm cultivars (Ulmnus americana) like ‘Valley Forge’ and ‘Princeton’ and Black Cherry (Prunus serotina). 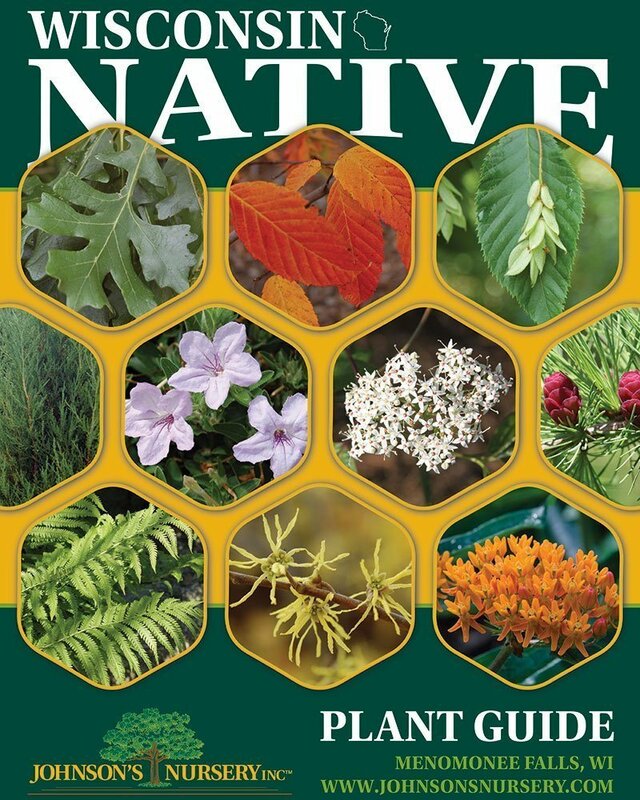 Some plants that will take longer include Kentucky Coffeetree (Gymnocladus dioicus) and Sugar Maple (Acer saccharum). The very slowest tree we grow is Shagbark Hickory. It is not unusual for trees of this species to take 14 or more years to develop into a two inch tree from a seed. Many trees are not produced from seed but are bud grafted onto seedling or clonal understock as part of the liner production. The vast majority of this type of material is purchased from specialized whip producers in Oregon. Most of these plants will take four or five years to develop a 2” caliper tree from a 5-7’ foot whip or light branched plant. I hope this has been an interesting journey into the life of trees in the nursery. We put an extraordinary effort into producing the best quality trees we can in the most reasonable time frame possible. They are transferred to you, the end user, to begin another cycle of life in the landscape. Hopefully, they live to a ripe old age!